His spokesman said: "The family of Richard Wright, founder member of Pink Floyd, announce with great sadness, that Richard died ... after a short struggle with cancer. The family have asked that their privacy is respected at this difficult time." Wright's spokesman did not say from what form of cancer the star had been suffering. 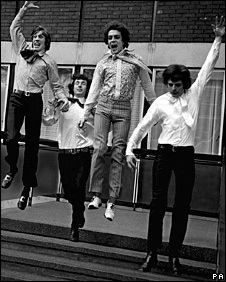 He was a founder member of The Pink Floyd Sound in 1965, and the group's previous incarnations, such as Sigma 6. This is terrible. No more Pink Floyd ever. Syd Barrett was important of course but Richard Wright was the Floyd of the years when they became a legend. I was hoping they'd do a last tour but that's it. ... Wow, I just got back from the café where I work.. We actually lit candles and played The Dark Side Of The Moon tonight... and we didn't know about this. I'm looking forward to that great gig. This is sad news and so sudden. Rest in peace Rick, you will be missed. I was coming back home from work a couple of hours ago when a friend of mine sent me a text message telling me such a sad news. I was shocked and I'm still devastated. I really feel bad and miserable. Remember that great gig in the sky. Thank you for everything, Rick. RIP. “In the welter of arguments about who or what was Pink Floyd, Rick's enormous input was frequently forgotten”. “He was gentle, unassuming and private but his soulful voice and playing were vital, magical components of our most recognised Pink Floyd sound”. “I have never played with anyone quite like him. The blend of his and my voices and our musical telepathy reached their first major flowering in 1971 on 'Echoes'. In my view all the greatest PF moments are the ones where he is in full flow. After all, without 'Us and Them' and 'The Great Gig In The Sky', both of which he wrote, what would 'The Dark Side Of The Moon' have been? Without his quiet touch the album 'Wish You Were Here' would not quite have worked”. Last edited by FPSHOT : Sep 16, 2008 at 12:17 AM. Pink Floyd has been in my top 5 best bands ever and He will be missed RIP I think its weird all these rock people dying at about mid sixties of cancer ..
What better way to remember Richard Wright? Here's Rick playing Breathe & Time from Dark Side of the Moon on Dave Gilmour's 2006 Live tour. Shine on Richard Wright. This is very sudden and sad news. Pink Floyd must be feeling like we did when George died. I was shocked hearing this, really really shocked.. Challenge proud_prudence in the Arcade! Pink Floyd star David Gilmour has performed one of the band's early songs in tribute to the group's keyboardist Richard Wright, who died last week. Gilmour gave a poignant rendition of Remember A Day, written by Wright, who died from cancer at the age of 65. The song was on Pink Floyd's 1968 second album Saucerful of Secrets. "He created a sound that glued the whole Pink Floyd thing together," Gilmour said on BBC Two music show Later... With Jools Holland. "He was just a very self-effacing but very talented, lovely chap. We're incredibly sad to have lost him." Wright had been due to accompany Gilmour on the TV show, but sent the guitarist a text message three weeks ago saying he would not be able to play. After his death, Gilmour decided to play Remember A Day. It is thought that the song had not been performed live for many years. 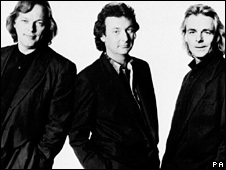 Wright sang lead vocals on the original version, which was recorded just before Gilmour joined the group. 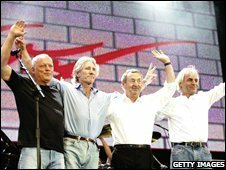 Gilmour recalled meeting Wright in 1965, when his first band supported Pink Floyd in "schools and big old youth clubs". Wright was "so shy and quiet", he told host Jools Holland. Asked about Wright's contribution to Pink Floyd, he replied: "He brought a slightly more jazzy and ethereal element to it all. "He had some elusive quality, let's call it soul, that glued the whole thing together. You notice it when it's missing." One edition of Later... was broadcast on Tuesday, with a longer version to be aired on BBC Two on Friday. For the Friday episode, Gilmour also performed The Blue, from his 2006 solo album On An Island. The album version of that song featured Wright on backing vocals, and Wright had also accompanied Gilmour on tour. The keyboardist was "revelling in what he was doing" in recent years, Gilmour said. "He had so much joy in him." The show also featured Mercury Prize winners Elbow, new US pop star Katy Perry and British hip-hop artist Roots Manuva. Later... with Jools Holland is on BBC Two at 2335 BST on Friday.